Understanding what customers want rather than what they may need is what separates brands from commodities. 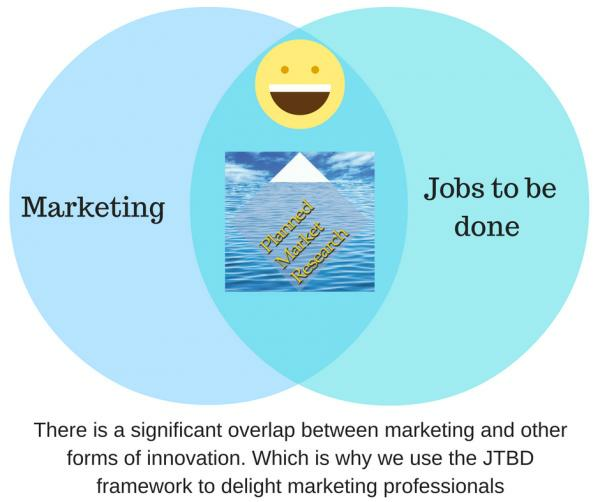 Although Drucker claims that marketing and innovation are the two key attributes of business, marketing is a form of innovation as it is designed to encourage a new behaviour in the customer in terms of switching brand. A key output of any Jobs to be Done research project is the jobs map which highlight where and when customers are looking for information and what information is required. This can then form the foundation for insight driven marketing. This can then be used alongside other communication tools (Google Analytics, Moz etc) as well as desk research, competitor analysis and monitoring scores to help create provide an evidence based marketing strategy or business information for a specific campaign.